Hello! Happy weekend! It's back to school for us here. Summer vacation is officially over, though not the summer heat. Unfortunately, that will likely be around for another month or two... Brina went back to school last week, and she made it 4 days before she caught a cold. She's normally a happy kid, but there's nothing like cough and congestion to make her miserable. I made a couple of mini note cards to slip into her backpack for when she is well enough to return to school. I pulled out some new product from the August Taylored Expressions release to make my note cards. The base of my cards were made using Labels Stacklets 4 and they are about 3" x 3". All of the images are from Classroom Cuties, a sweet new set illustrated by Emily Burger. 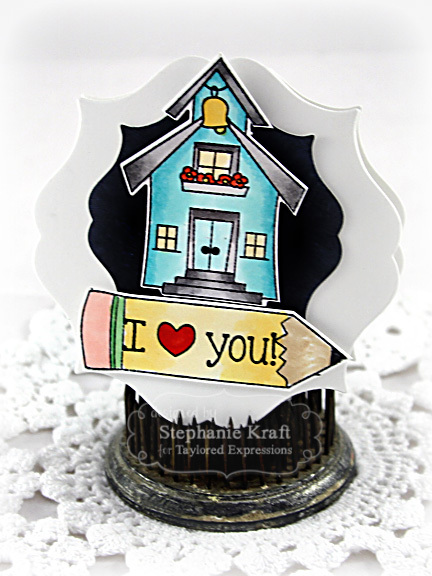 I also used the Back to School coordinating dies (cup and school house). The pencil was part of a larger image which I hand cut. Accessories: Taylored Dies: Back to School, Labels Stacklets 4 (TE); Markers (Copic), Foam tape. 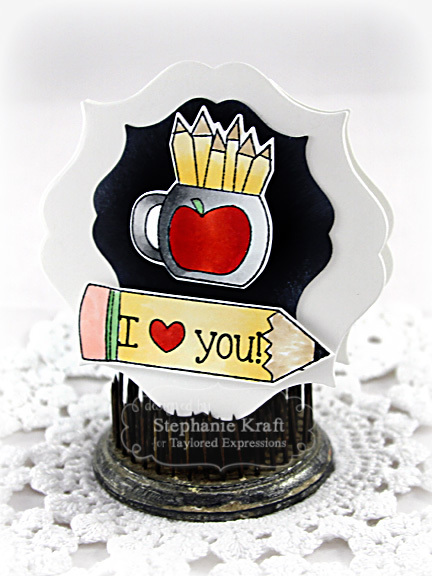 Cute projects Stephanie! Surely ANY teacher would love to receive one of these! Great job coloring all the detail! LOVE this! I need to learn to use copic (or whatever they're called) markers! Any suggestion for newbies?